This post about the Best Organic Items to Buy at ALDI is sponsored by ALDI. All the opinions expressed are 100% my own. 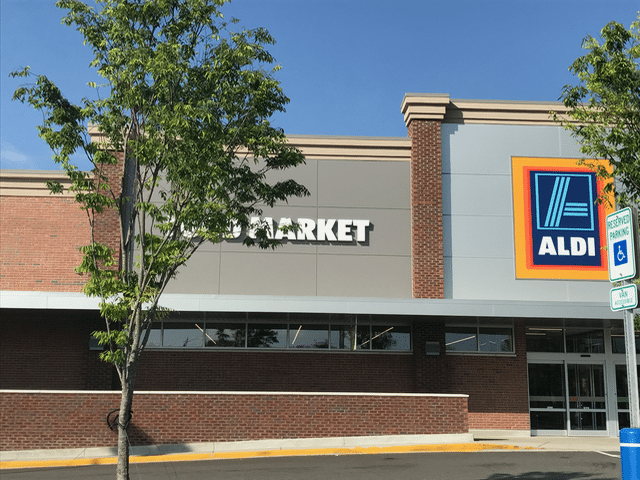 It has been a couple of years since the ALDI opened near me and I wrote about my experience. I have run into the store a few times since for a few items since but recently partnered with ALDI and decided to shop there for a girls lunch. They truly surprised me this time by all the great organic products they had on the shelves and the amazing prices too. We have several different grocery chains near me so I am in and out of several in any given week. Nature of the job and my lack of meal planning! After my last trip to ALDI, I realized there are some great deals on organic items and I want to share them with you. What you need to know in advance is ALDI carries 90% of their own exclusive brands so these deals are for items most likely very similar to the brand names you already purchase. Not only are the price points lower, but the quality and taste of the products are so much better! If you buy organic milk, it is almost $4 a half gallon at most grocery stores. 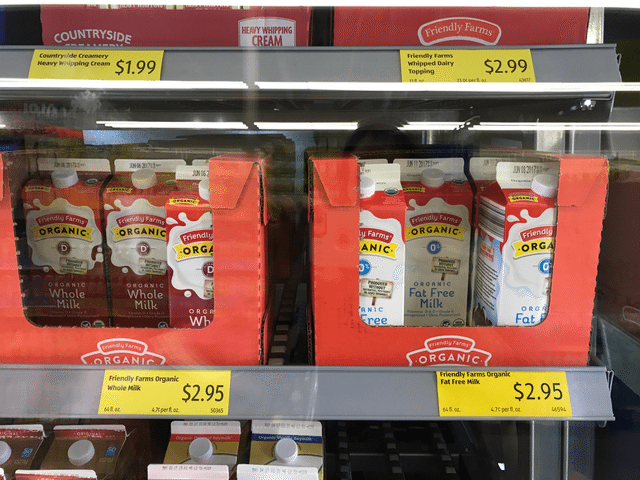 Not at ALDI, check out the everyday price of their organic milk! 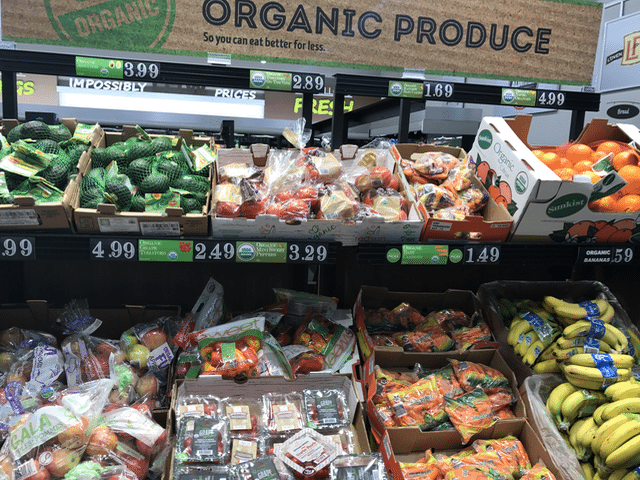 ALDI has an entire section dedicated to organic produce. From peppers to apples you can find great prices on these everyday items. At the stores I visited, this was not in the refrigerated section but at the end cap of the other produce. They have great prices on both milled and roasted flax seeds and their chia seeds too. I recently purchased some of this to make my own Magic Shell Ice Cream Topping so I know this is a great price. There are so many uses for coconut oil lately I may be buying more. 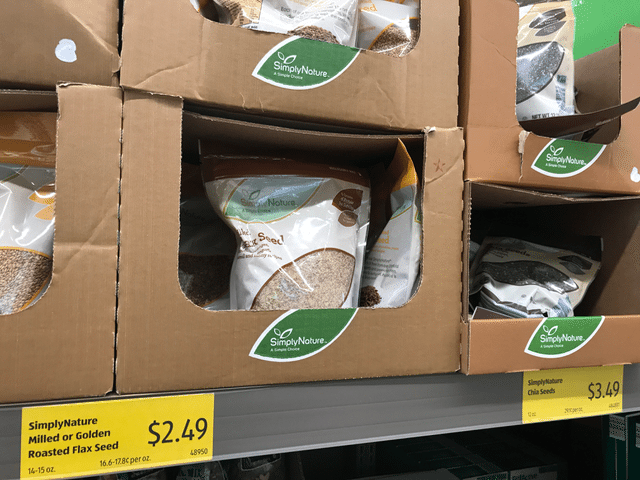 This by far was one of the best prices I have seen for quinoa, and it was organic. Quinoa is such a good source of protein too that more and more people are using it in both side dishes and main dishes. Buying organic berries is a great way to avoid pesticides. ALDI carries both organic strawberries and blueberries which are great for smoothies and baking. This is just a small sampling of organic items available at ALDI stores but these are the ones I shop for a lot so can spot a good price. I would love to hear about the organic Items you shop for at ALDI because of the great pricing too. 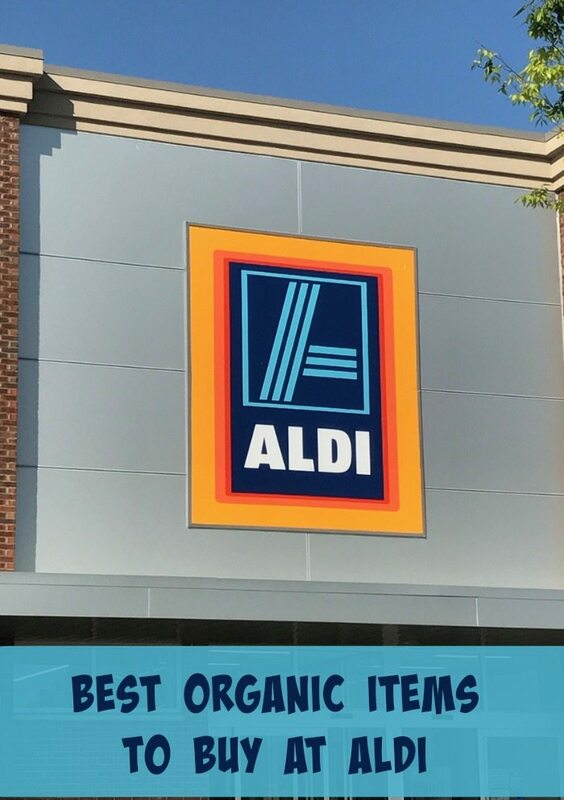 Pin this for next time you shop at ALDI to remember the Six Organic Items You Should Buy at ALDI ! What grocery items do you buy only at ALDI because of the great pricing? I love Aldi’s. This is my fave store. I also scored the chia seeds and love them in smoothies. I cut my grocery shopping in half by shopping at Aldi’s. I know I was amazed at that pricing on the organic quinoa too. They have been popping up here for the last 2 years. Flax Seeds are a must, I have been sneaking them in so many things. Super great way to get some fiber into the diet 😉 Glad you have found so many things that are organic that you can get at ALDI. I love it! 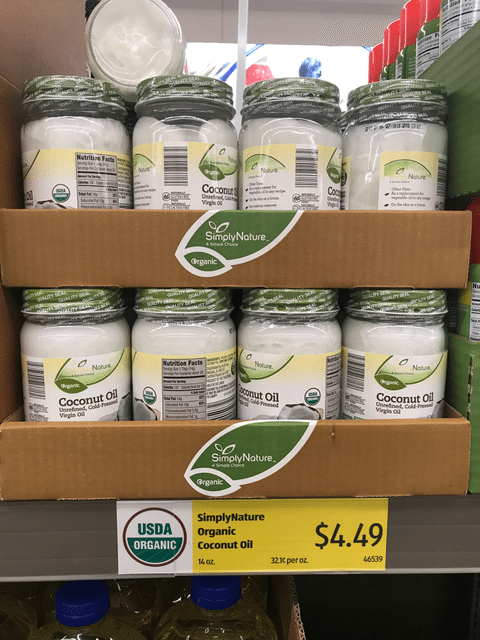 I always try to buy organic coconut oil. I need to venture out more in other organic products. Unfortunately, we do not have an Aldi. I have heard that Aldi is loaded with organic goodies. 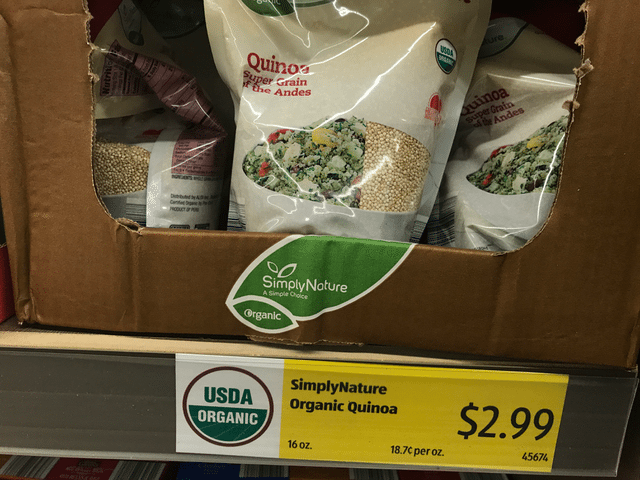 I have to get over there – great price on that quinoa. I just paid $7 at target for a tiny bag.